In The Hunger Games, the nation of Panem (implied to be North America after some sort of post apocalyptic scenario) is divided into 13 districts and the Capitol. District 12 is hinted to be in the Appalachia Mountains, and the Capitol is hinted to be in the Rocky Mountains. District 13, which was destroyed, is described as "east of District 12", which made me think it's where Washington D.C. is today. The other districts, however, were mostly ignored, and almost no detail was provided as to their locations in the books. Has there been any supplemental information that reveals where the districts are? Panem is actually where North America currently is, they're not confined to just the current area of the USA. 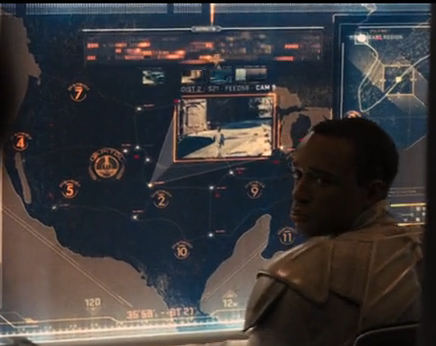 Here's a map from a brief shot in the Catching Fire film. They haven't released an official map, as far as I know, nor do the books fully describe the locations of all of the districts. Panem is located in the "remains" of North America, and was formed at a time when the human race was dangerously close to wiping themselves out. This would imply that large swaths of formerly densely-populated areas are now uninhabitable from the use of some form of WMD. Think of any current North American city with a population >1m, and pretty much wipe a 100-mile radius around that city off the map permanently. Most of what the map shows as District 12 wouldn't be habitable. District 12 is described in the book as being one urban center with mines just underneath it, and the whole complex within the electric fence is within pretty easy walking distance. Everybody in District 12 was expected to be in the square for the Reaping, and they only got Reaping Day off to be there; that means there likely aren't other urban centers within the District. My view of the world of Panem was of small areas of habitable land in between large swaths of wasteland around what used to be dense population centers. These Districts aren't "states" or "regions" as we'd know them; they're more like cities; small population centers in areas where people can still live, and that have economic interest to the Capitol. Let's say the nukes didn't hit present-day Beckley, WV; it's only got a population of about 20,000 people, and there are a lot of coal mines around it. 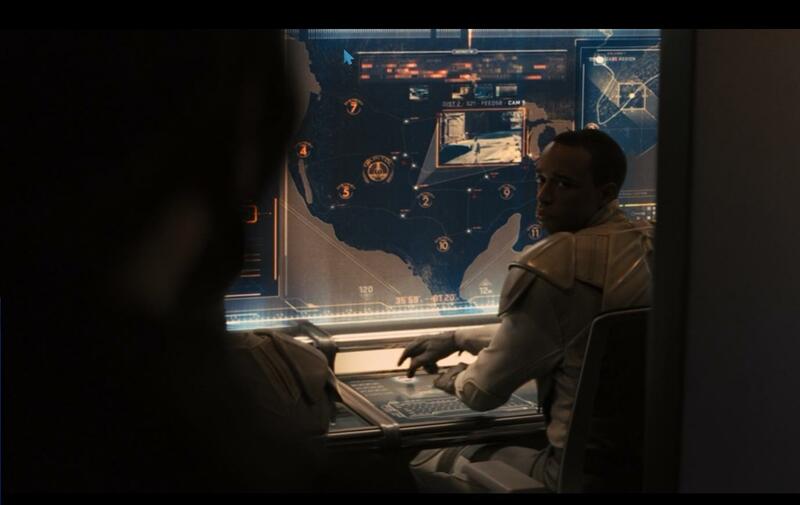 That could well be the location of District 12 in the novels, after the human race re-centered around what was left. The fences would basically enclose what was needed (which would be within walking distance) and everything else around that very small dot would be "the wilds". The other districts would probably be very similar: small patches of habitable, even arable land that are all that's left after the major population centers surrounding them were destroyed. Districts 4, 7, 10, and 11 are highly agricultural, and so would take more land than just the urban center/manufacturing complexes of the other Districts. These Districts might count more land as being part of the District (since it's maintained and so not "wild") and may have a rudimentary, "no-frills" rail system branching off the main lines for transporting "day laborers" out to the fields/pastures/fishing grounds. The Capitol is tricky. The map seems to center The Capitol around an area in the middle of nowhere near the T-corner of Utah, Colorado and Wyoming. There's a pretty decent river/reservoir there, but not much else, making it prime real estate when everything else has been made unlivable. At first I thought the map may be inferring that the Capitol is around Cheyenne Mountain, but first being near a major population center (Colorado Springs), and second being a VERY high-priority target for WMDs (NORAD), it would be very likely reduced to smouldering radioactive glass. Check out the following link: http://aimmyarrowshigh.livejournal.com/32461.html This was made by Aimmyarrowshigh & Badguys. I am VERY impressed with their rationale and final product. Big fan of their work on this. D13 specialized in nuclear power, shares a border with D12, is both visible and reachable from D12 by foot, and is North of West Virginia. Three Mile Island was in Londonderry, Pennsylvania (107 miles west and slightly north of Philadelphia) and probably remained a nuclear reactor or was co-opted again as a reactor. D13 is small but mighty and is surrounded by Wilderness. It is self-sufficient. I know you referred to the books; but there is a brief shot in the Hunger Games: Catching Fire movie that shows the location of some of the districts. It depicts generally what has been described here already (i.e. mainly based around the current United States in North America). Like Keen said, the books refer to North America, not specifically the USA as the home of Panem, so Canada/Mexico are certainly included somehow. District 12 is definitely in the Appalachians, 11 borders on it and encompasses a large agricultural region, so it is generally portrayed in the southeast. The capitol is in the rockies, and it is likely that District 2 is as well. Other than that, it is guesswork. One thing often missed on the fan maps - the books make it clear that the oceans have risen and the coastlines changed. How much they don't say, but it does make the more common fan maps inaccurate. Edit - And I see now that Keen's map does account for the higher sea levels. Not sure how I missed that first time around. Makes my answer a little more redundant. 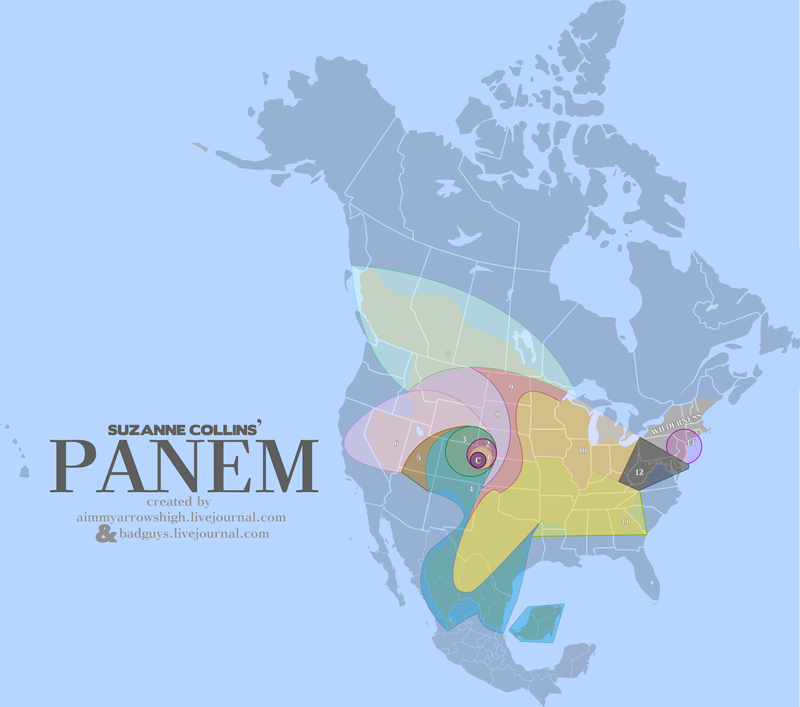 Panem is located in a ruined North America (so modern-day America and Canada). The Capitol: is located near Salt Lake City. The city would most likely be kept in one piece, and is located in the midst of the Rocky Mountains. District 1: is located directly north of the Capitol. They produce luxury items and the district is located in northern Utah and Idaho. District 2: is located to the southeast of the Capitol in modern-day New Mexico. District 3: is located in California and Nevada. District 4: is located in southern California and Mexico along the coast. District 5: is located in Arizona. District 6: is located near the ruins of Chicago. District 7: is located in the Pacific Northwest. District 8: is located near Rochester in modern-day New York. District 9: is located in the Mid-West somewhere. District 10: is located in Texas and Oklahoma. District 11: is located in the Deep South, near Atlanta. District 12: is located in Appalachia. District 13: is located in central Pennsylvania. District 14: is located in Maine and New Hampshire. What US state does Katniss Everdeen live in? In The Hunger Games series, which part of our current real world becomes Panem in future? Where are the Arenas located? What were the creatures in Hunger Games made of? Was technology the same when the Capitol began hosting the Hunger Games seven decades ago? In the world of The Hunger Games, can people move to a different district? Who are the office workers in Panem?